Some private lenders are charging lower rates than the government this year, but beware the tradeoffs. Interest rates are lower for both federal and private loans this year. Good news for college students and their families needing to borrow for the upcoming school year: interest rates are lower for both federal and private loans. Among government loans, subsidized and unsubsidized loans for undergraduates are 4.29%, down from 4.66% last year, and for graduate students they’re 5.84%, down from 6.21%. PLUS loans for parents and graduate students, which, unlike other government loans don’t have loan limits beyond the cost of education minus financial aid, are 6.84%, down from 7.21%. Private loan rates have also fallen — some even to levels below government loan rates — but they vary depending on the institution. Some private lenders are even offering special discounts this year. SunTrust is offering a 0.75% discount for loan applications submitted before Sept. 1, and Wells Fargo is offering a 0.25% promotional discount for applications submitted before Sept. 30. It’s no surprise that government loan rates have fallen. They’re computed as a spread to the 10-year Treasury note, whose rates are down 25 basis points, or 0.25%, from last year. But that’s not the case for private loans. Their rates are usually set as a spread to short-term Libor rates, which are slightly higher than a year ago. So why are they also lower? That competition is not only about rates but fees. Citizens Bank has no application, origination or disbursement fees for its student loans. The federal government, in contrast, charges roughly 1.07% for subsidized and unsubsidized loans and 4.3% for Plus Loans. But there’s more to consider beyond just rates and fees when shopping around for a student loan, according to financial advisors. The comparisons will vary if the government loan is subsidized or unsubsidized, if the loan — whether public or private — is for undergraduate or graduate students, and whether the borrower is the student or the parent. Government loans also generally have more flexibility when it comes to repayment. They allow borrowers who can’t make payments due to financial hardship or illness to delay or reduce payments under a program known as forbearance. There’s also Income-Based Repayment, which reduces monthly payments for those earning below a certain income level, and loan forgiveness programs for those who work in government or the nonprofit sector for a period of time. But the flexibility is not as much of an issue when comparing private and government loans taken out by parents rather than students. “If the parents have excellent credit, the private parent loans can have significantly lower cost and the differences in benefits isn’t as severe,” says Kantrowitz, noting that parent PLUS Loans, like private loans, aren’t eligible for income-based repayment or public service loan forgiveness. But, Kantrowitz notes, private loans typically allow for only one year of forbearance and often cannot be discharged in the case of death and disability, which is not the case for government loans, which also allow for up to three years of forbearance. 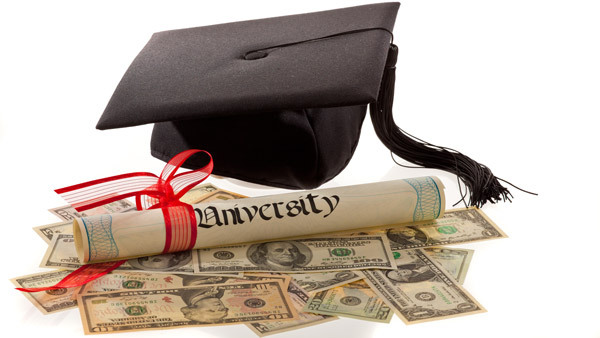 The comparisons between private and public loans also differs for graduate students. Private loans offer “the potential for significant savings if the graduate/professional student has excellent credit,” says Kantrowitz. Indeed, CommonBond charges just 5.59% for a 10-year loan for MBA students with FICO scores in the high 600s, compared with 5.84% for a government loan. “We are able to offer lower rates because our investors believe, as do we … that creditworthy borrowers are being assigned too high a risk premium by traditional institutions and are therefore willing to provide funds to finance and refinance graduate education at a lower rate than the one-size-fits-all rate the government has offered,” says Chief Operating Officer Robb Granado.